Hands up if your little ones, like mine, are fans of Peppa Pig. It is one of the most popular children's shows on TV - captivating and entrancing our little ones. If the month of May wasn't exciting enough for my family with so many occasions to enjoy - including many birthdays (me, my Mum & my Nanna to name a few) and Mother's Day - it's also Peppa Pig's Friendship Month. And to celebrate, Peppa Pig's helpers are offering one lucky Gold Coast Mum reader a Peppa Pig Girl's PJ Pack* valued at $50. At the moment, in our household, we are counting down til June 14 when hubby and I will take Miss 4, Mr 2 and our twincesses (now 6-months) to see the Peppa Pig Live Show at the Ipswich Civic Centre to review (look out for my review on the blog in the days after). After a smash hit season on London’s West End and at capital city theatres around Australia, this delightful puppet show is embarking on an extensive tour of Australia in 2014. Peppa is a lovable, cheeky little piggy who lives with her younger brother George, Mummy Pig and Daddy Pig. Peppa loves playing games, dressing up, visiting exciting places and making new friends, but her absolutely favourite thing is jumping up and down in muddy puddles. Her adventures always end happily with loud snorts of laughter. You too can enjoy your own Peppa Pig adventure this May. Simply visit any ABC store this May to ‘find Peppa and her friends’. Collect an entry form from the till point and write down the name of the characters that you find. Once you have completed the hunt, hand your completed entry form to the counter to be entered into the competition and receive a Peppa Pig giveaway. 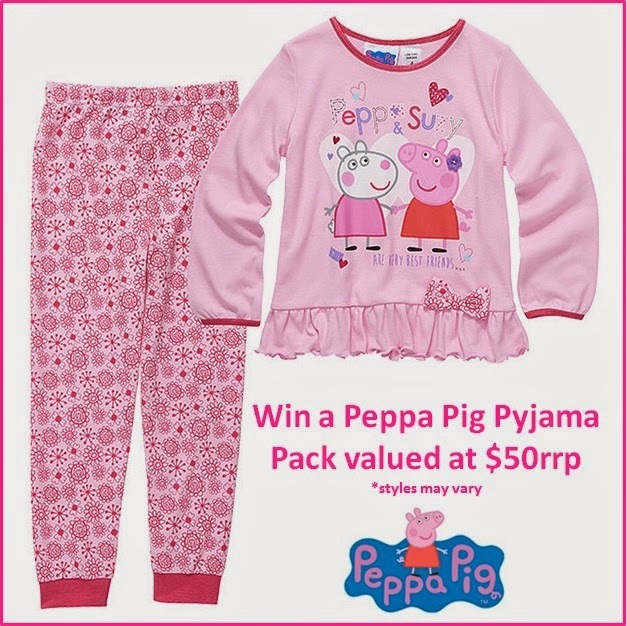 For your chance to WIN a Peppa Pig Girl's PJ Pack valued at $50, enter via Rafflecopter app on the right - by liking Gold Coast Mum on Facebook and commenting on this blog post before May 31st. Note: Styles and sizes vary, giveaway winner may request a size between 3-6. Sizes are not guaranteed, but we will do our best to accommodate. *Winning entry will be screened to ensure it meets these requirements. * Entry is open to Australian residents only. * The winner will be notified by email/Facebook and will need to respond within 48 hours. If no response in this time, a new winner will be drawn. * Total prize value is $50. * Gold Coast Mum is not liable for prizes that are not delivered or damaged in the post. * Judge's decision is final. * This is not a sponsored post. No payment has been received. I know Jennah would love this. Good luck to everyone! What a gorgeous prize for a lucky gal! Fantastic PJ's for a Peppa Piggy Fan!!! Gorgeous Peppa Pig PJ's, it will be a very lucky Peppa fan who wins these. How will I ever get Little Miss Four to sleep if she was wearing these. Great giveaway, everyone loves Peppa!! All my kids love Peppa Pig, boys and girls. Even I like watching it! Thanks for the opportunity to win; my daughter would love these pj's! I love these PJs, so cute! I have a special little girl who would love these pyjamas! I know a little girl who would love these Pjs! I have a huge Peppa fan here, she would love these pjs.